The Government has confirmed that the TV licence fee will increase by £1.50 a year on 1st April - the first increase in seven years. Last increased on the 1st April 2010 to £145.50, the annual cost of a colour TV licence will increase to £147 a year effective 1st April 2017. But viewers will be still be able to pay for the licence in smaller monthly installments, working out at £12.25 a month. Since September, iPlayer users are also required to be covered by a TV licence, in a move to fill a loophole that helped an increasing number of viewers to avoid paying. The budget shortfall forced the BBC to make additional cuts, which led to the loss of live TV coverage of F1 racing. April's increase has been calculated by the Government based on the Consumer Price Index (CPI) rate of inflation as measured in September 2016. 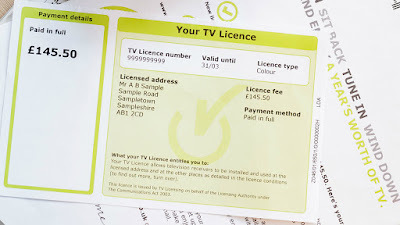 But not all viewers will see an immediate increase: Licence fee payers will receive a payment plan or a reminder reflecting the new amount when their licence is next due for renewal. Those buying or renewing a licence after 1 April will pay the new fee. Those already buying a licence on an instalment scheme which started before 1 April - such as monthly direct debit or weekly cash payments - will continue to make payments totalling £145.50 until their licence comes up for renewal. Anyone still using a black and white TV will need to pay an extra 50p a year, with the annual black and white TV licence rising to £49.50. The free concession for over 75s remains, although at present this is not issued automatically, and anyone entitled to the concession must apply for it. A 50% discount applies to blind or severely sight impaired person, meaning the TV licence cost is cut by £73.50. The BBC will be required to take over the cost of providing free TV licences for the over 75s at the end of the decade, which will cost the broadcaster over £700 million a year - more than the combined annual budget of BBC Two, BBC Four, CBBC and CBeebies - meaning that although the first licence fee rise in seven years will provide extra income, the extra cost of covering the cost of over 75s licences means the BBC will continue to have to make further budget cuts. The seven year freeze on licence fee income was cited as a factor in the decision to remove BBC Three from traditional TV platforms in 2016, although the BBC has now announced the creation of a new evening only channel just for Scotland.